A simple analogy is the best way to understand power factor. Please read what is power factor before reading this article. Beer mug analogy is already explained here. In the figure, a horse is pulling a railroad car down a railroad track. The railroad tire are uneven, so the horse must pull the car from the side of the track. The horse is pulling the railroad car at an angle to the direction of the car’s travel. The power required to move the car down the track is the working Of real power (kW). The effort of the horse is the total or apparent power (kVA). Due to the angle of the horse’s pull, not all of its effort is used to move the car down the track.The car will not move sideways, therefore, the sideways pull of the horse is wasted effort — the nonworking or reactive power (kVAr). 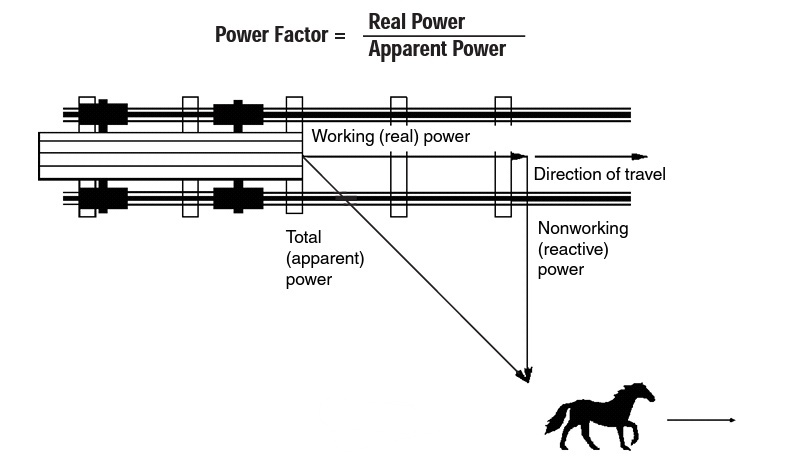 The angle of the horse’s pull is related to power factor, which is defined as the ratio of real power to apparent (total) power. If the horse is led closer to the center of the track, the angle of side pull decreases and the real power approaches the value of the apparent power. Therefore, the ratio of real power to apparent power (the power factor) approaches one. As the power factor approaches one, the reactive (nonworking) power approaches zero. In the ideal horse pulling the railcar analogy, if the reactive power (kVAr) is near zero, then real power (kW) and apparent power (kVA) would almost be equal, which means the horse would not waste as much energy pulling the car. The angle formed between real and apparent power would approach zero. The cosine of the angle would then approach one, resulting in a power factor that approaches one. The closer a system’s power factor is to one, the more efficient the system is. 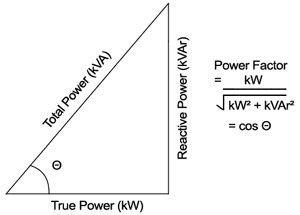 One way to illustrate the relationship between real power, apparent power, reactive power, and power factor is with a power triangle. As seen, only 70% of the current provided by electric utilities is being used to produce work. then Power Factor = 100/142 = 0.70 or 70%. This indicates that only 70% of the current provided by the electrical utility is being used to produce useful work.